What is an End User Licensing Agreement? An end user licensing agreement is also known as a software licensing agreement. What is a Licensing Agreement Template? An end user licensing agreement is also known as a software licensing agreement. It is used by the licensor, who is usually the distributor of the software or product. It will then need to be agreed to by the purchaser or the user of the software. Most end user licensing agreements are used in a digital format. There may be different versions of the licensing agreement for different types of users. For example, you may want to have one specifically for individual users and one for government entities or other large corporations. 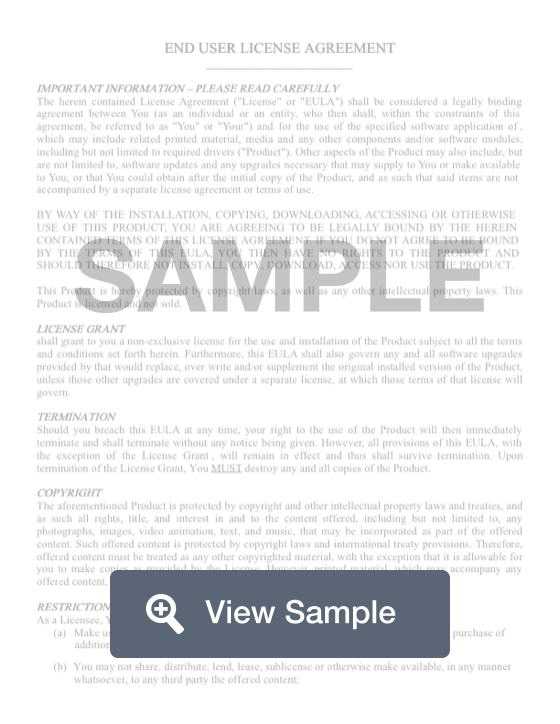 A EULA, or end user licensing agreement, should include information about the product, the ways that a user is allowed to use the software, and any important disclaimers. The agreement may need to be updated over the course of the product's lifespan with new information and details. Create a free End User Licensing Agreement in minutes with our professional document builder. When is a licensing agreement needed? Exclusive License - An exclusive license give the licensee the exclusive right to use the IP. Not even the licensor is permitted to use the IP. Once the licensor grants one exclusive license, no other licenses can be granted. Non-Exclusive License - A nonexclusive license grants a licensee the license to use IP, but the licensor remains free to use the IP or grant licenses to other parties. Many parties can hold non-exclusive licenses to the same IP at the same time. Sole License - A sole license grants the licensee an exclusive license, but allows the licensor to also use the IP. No other licenses will be granted. Co-exclusive license - A license may also specify that licenses will only be given to a limited group of other licensees, who could be specified by name, description, or number. This form of license is sometimes known as a co-exclusive license. 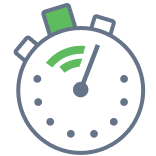 Duration of contract and termination terms - Decide when the contract begins and ends and what actions might terminate the contract between the parties. Exclusivity - Decide whether to grant an exclusive, non-exclusive, co-exclusive, or sole license. License Terms - Here is where you would indicate if a licensee is only allowed to use the IP for a particular purpose. Also indicate whether the licensee is allowed to grant sub-licenses. Geographical restrictions - Some licenses restrict the geographical area where a license can be used. This is done to prevent competition and is often done in franchise license agreements. Royalty payments - Determine whether you will take a lump sum payment as valuable consideration or a per item fee or a percentage of net sales. This clause may also include a performance agreement that specifies that the licensee must achieve a certain level of performance or be in danger of losing their rights. Property modifications - Decide whether to give the licensee the right to improve or modify your property. You can specify what types of changes you will allow and who will own the rights to the new and improved version. Dispute resolution - Select the governing law and method of dispute resolution, should any conflicts arise. Many parties will choose to have a mediator or binding arbitration. Warranties - This section guarantees what you promised to deliver. Typically you will warrant that the property that you provide will be error-free, and in good, final condition. Confidentiality agreement and nondisclosure - The licensee promises to protect the licensed property and confidential information. Transferability - Indicate if this is a nontransferable license. Most business property can be licensed. The most common types of licensed property include: trademarks, digital assets, copyrights, and patent licenses. How do I get a property licensed? To license a property to another, you must first have the rights to the license. Typically this is done by having an original idea and then applying for the appropriate intellectual property protection: a patent, trademark, or copyright. If you have an idea that you think others may want to use, it is advisable to seek legal counsel. A lawyer can assist you with making sure that you are protected and with drafting a fair licensing agreement that protects all parties. If you are negotiating a license with another company, they will typically be represented by an attorney. If the other party has an attorney, it makes sense to retain your own attorney to protect your interests. If you do not have a licensing agreement, the owner of IP will be unable to make money off of it or control its usage. Parties who wish to use that IP might not have access to it or be unable to make money from it because too many other parties have access to it. Without a licensing agreement, licensors suffer from lost time preventing others from using their IP, lost money for businesses using IP without paying for it, and loss of goodwill by having their trademark diluted. Licensees suffer because they lose time defending their right to use the IP, the lose money because they are unable to capitalize on the goodwill of the IP, and they may have to deal with cease and desist letters and lawsuits from the IP owner.